Your choices among the vast array of things to do in the Virgin Islands are determined by age, interest, ability, stamina, and budget. Of course, with time and money, anything is possible. If you can swing it, we highly recommend taking a day trip to visit neighboring islands. The consensus among our local activities experts is that the ideal VI vacation includes 2-3 paid activities with at least one of them organized by a professional tour operator. This is your vacation, relax and let the local experts show you a good time. A miserable little one can put a huge damper on a family vacation so stick to their schedules as much as possible. Best to choose simple activities that don’t have large time commitments and are close to conveniences and comforts like showers, toilets, food and shade. Small children tend to be more sensitive to new environments, sun, heat and biting things. Water is the best activity for young children. Try beaching it at Trunk Bay on St. John or Magen’s Bay on St. Thomas. Buy some flotation thingies, beach toys and a pop up shade canopy. Build sand castles and splash along the water’s edge until nap time. Parents who want to be more active could consider renting a kayak or SUP board for 1/2 day and tooling around with your little ones perched on your lap or sitting between your legs. A visit to Coral World on St.Thomas to pet the baby sharks, have fun with the “touch tanks,” look at the sea turtles and see all the pretty parrots is great fun for tots. Ready for a big adventure? 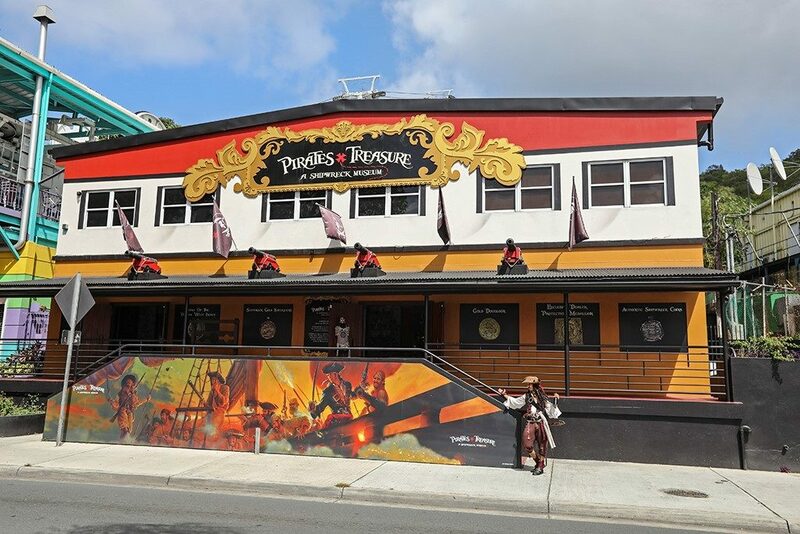 Consider stop at the Pirates Treasure Museum on St. Thomas where you will learn all about maritime and St. Thomas history, visit their wonderful gift shop full of real treasures, and even meet a real pirate! Afterwards, you can take a beautiful tram ride to the top of Paradise Point (this activity is recommended for all ages)! Due to limited service and huge roaming charges, a vacation in the VI is the perfect excuse to disconnect yourself and your kids from technology and the perfect place to get introduced to boating. If they’re boating novices, test the waters with a 1/2 day trip in local waters. Choose a large catamaran operator who offers drinks and snacks along with an intro to snorkeling. If they’re ready for more adventure and you all want to be WOWED, take them on a full day charter to the Baths on Virgin Gorda in the BVI. Need a chill day? Hit the beach and rent a SUP board at Magen’s Bay on St.Thomas, Cinnamon Bay on St. John or a pool day at the Westin on St. John. There will be plenty of young people at all of these places and plenty of amenities. Want memorable, experiential family activities? 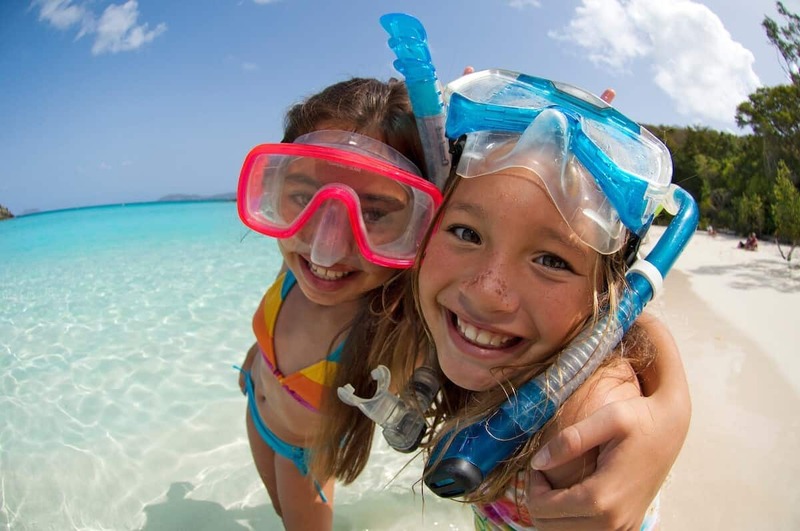 Rent snorkel equipment and check out the world famous underwater snorkel trail at Trunk Bay on St. John. Take a guided kayak tour through the mangroves on St.Thomas or the East End of St. John. Looking for a big thrill? Consider a zip-line tour through the forest canopy on St. Thomas. This is a romantic place, so take advantage. Go on a sunset sailing cruise. Get a couples massage on the deck of your villa. Traveling with friends? Take the rock star tour and charter a luxury power boat to visit the BVI’s. Snorkel around Sandy Spit, go to Peter Island for lunch and White Bay on Jost Van Dyke for a little afternoon white-sand beach time. Want something a little more relaxed? 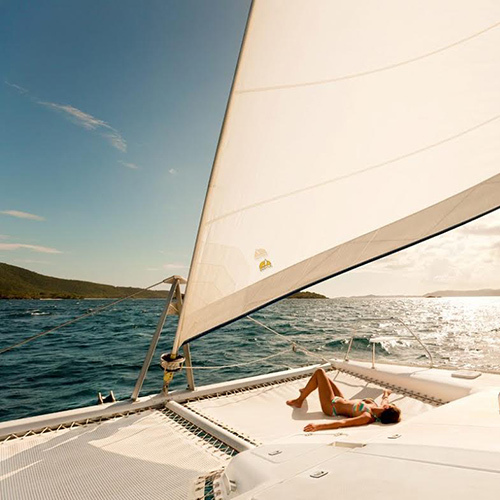 Consider sprawling out on a luxury catamaran day sail. In need of a little exercise? Take a short hike and picnic to secluded Denis Bay, St. John. Rent a double kayak and explore the private inlets of Hurricane Hole, St. John (part of the Underwater National Park Monument). Bullseye activity…take to the skies and thrill yourselves with a helicopter tour around the islands. Get married on the beach… or better yet, practice your honeymoon! Visit Mountain Top, the highest point on St.Thomas for breathtaking views of St. John and the BVIs. Take a historical tour of downtown Charlotte Amalie. Up for a little thrill but not interested in ziplining? How about a tram ride to the top of Paradise Point, St. Thomas? Relax and enjoy sunset cocktails at luxury resort Caneel Bay on St. John. Try a 1/2 day or sunset sail on a comfortable catamaran. Check out the numerous educational and guided activities offered through Friends of the Park (book early!) in the National Park on St. John. Sign up for their popular “Bird Nerd” tour around Francis Bay bird sanctuary. Try a self-guided tour around the Cinnamon Bay Plantation ruins. While there, cross the street and visit Cinnamon Bay’s archaeology museum. Then go for a walk on the beach (St. John’s longest). On your way back to the car, admire the largest Rain tree on St. John – all of this right at Cinnamon Bay. On another excursion, enjoy a relaxing day at Maho Bay, St. John. Park and roll onto this easy access beach with plenty of shade and great snorkeling! Go scuba diving on the Wreck of the Rhone, Salt Island, BVI. Learn how to kite surf on the North Shore of St. John. Go zip-lining through the forest canopy on St. Thomas. Rent kayaks and a private guide to paddle around the cays surrounding St. John. Hike to the Bubbly Pool on the backside of Jost Van Dyke. Hike to the petroglyphs and waterfall on the Reef Bay trail and/or the Ram Head and Brown Bay trails on St. John. Snorkel out to and around Waterlemon Cay, St. John. Surf Apple Bay and Josiah’s on Tortola. Take a helicopter tour around the islands! Plan a full day (or two) on a power boat trip to the BVIs. Hit Ivan’s, Soggy Dollar and Foxy’s on Jost Van Dyke. Stop in at Myett’s and walk on over to the Callwood Rum Distillery in Cane Garden Bay, Tortola for more than a taste. On your way home visit the floating party ship “The Willy T” on Norman Island – jump naked! Plan to spend the night at the full moon party in Trellis Bay, Beef Island. Get an education on rum from Kim at Asolare, St. John. 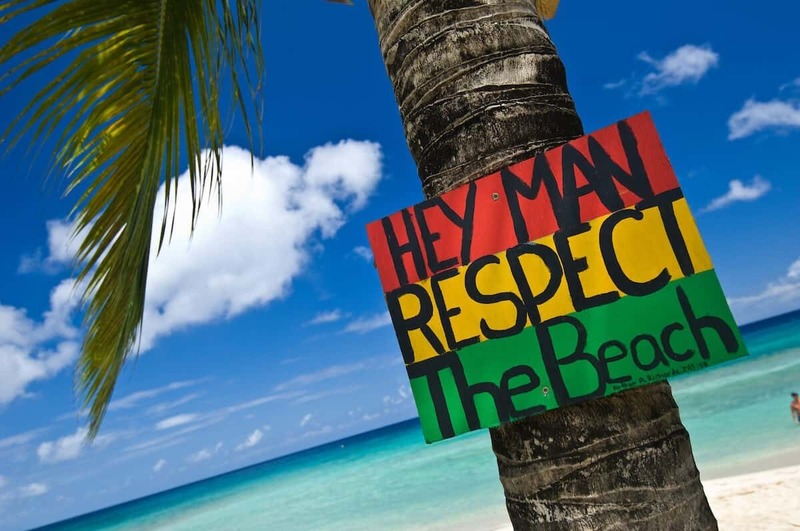 Catch the live music scene at Iggy’s Beach Bar, St.Thomas. Recover and cool out on Abbi Beach, St.Thomas or cool your brain (for real) at the Caribbean’s only ice bar, “Magic Ice” in Charlotte Amalie, St. Thomas. On the following pages, we break down the best things to do in the Virgin Islands by activity type with brief descriptions of what to expect along with which groups would be most appropriate. Please Note: When possible we quote prices but these are only for ballpark budgeting purposes. 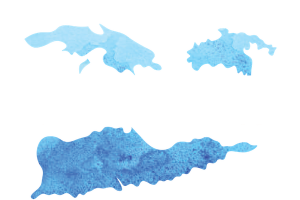 Prices vary depending on island and venue (resort concession or privately run business). Do you have more questions (or answers) about things to do in the Virgin Islands? Let us know in the comments below what we missed.